Interface names. All variants that I came across are included, but the list will certainly be incomplete. Added some minor improvements to the config-script. 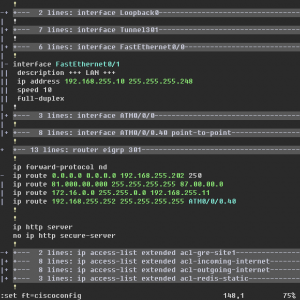 I also wrote a seperate script to fold routing tables (sh ip route). This entry was posted by Niobos on 2008-06-08 at 20:40 under Networking & Security. Tagged Cisco, gvim. You can skip to the end and leave a response. Pinging is currently not allowed. Follow any responses to this entry through the RSS 2.0 feed. I copied the script into .vim/plugin/cisco.vim. Tried couple of times with different versions of vim (7.1.138 ), gvim and it does not seem to work?? Any ideas? I didn’t configure vim to automatically detect the filetype, so I manualy type “:set ft=ciscoconfig” whenever I want to. The reason behind this is that most of the config-files resides somewhere in a bigger log-file. During the copy paste, somehow the ATM-line fell out. I corrected that. This looks great, but in vim 7.0 whenever is invoke this colorscheme the interface statements and ip route statements disappears. The class map and policy map also doesn’t colour. Class maps and policy maps don’t color because I didn’t write the rules for them yet. If you send me a (piece of) a config file with a bunch of class/policy maps, I’ll try to get these colored/folded as well. I will send you a piece of a config file with class/policy maps. 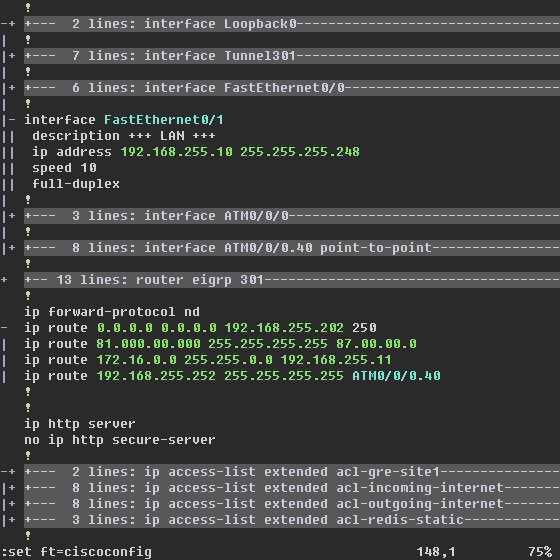 Better… if you want I can sent you a whole config and that way you (and I :)) can color the whole cisco config. I was about the learn how to do syntax highlighting in vim, because lots of colleagues wanted such syntax highlighting. Sent me your email at my email address please..
That way we can communicate better. P.S. the “zR” didn’t help….. but is this syntax file for vim or gvim?… I understand that there is a slight difference between a syntax file for the two. The syntax file should work for both vim and gvim, although I only tested it in gvim. You should have received an email to arrange for the config file. I work on a syntax highlighter for blog posts, same thing –> none found on Internet yet. Took a look in your code for the IP address Regex. Thanks! Wondering why its not working for me? Nothing happens when give command :set ft=ciscoconfig. You normally put your own config-files in your own path, not in the system path (although that should work as well). Have you tried putting them in your user-directory (http://agateau.com/2007/10/04/note-to-self-path-to-vim-files-on-windows/ might help in finding it). Not verse with systems, I did a small test. And Java’s code highlight stopped working. This ensures that Gvim is referring this path only. I have a large number of router configs that have class maps. I tried to copy your interface line to fold the class-maps. I keep getting an E475 error “invalid argument” Any help would be greatly appreciated. Can you post more information about your error. Does it say on what line of what file the error occurred? What do you mean by “your interface line”?